(Trent Nelson | The Salt Lake Tribune) Utah Jazz center Rudy Gobert (27). Utah Jazz vs Memphis Grizzlies, NBA basketball in Salt Lake City on Friday Nov. 2, 2018. Never been one to complain about officiating in any sport. I never took any pleasure in it, never saw much use for it, especially as it pertains to NBA basketball. The refs typically do the best they can, within the framework of human limitations. But let’s say it the way it is here: Rudy Gobert is getting jobbed by NBA referees. Anyone who pays close attention to what has happened to him on the court since he openly complained recently after a game about officiating can see it. The most egregious examples came in subsequent games against Houston and Oklahoma City. In the first case, Gobert was called for a foul on the opening jump ball, a call that is almost never made. The second came in the Jazz-Thunder game, when Steven Adams all but ripped Gobert’s arm loose from his shoulder socket, hooking that arm, locking it in, then pulling Gobert to the floor. The whistle came, the call was made against … well, You-Know-Who. A technical foul followed because technicals usually follow a lousy call put upon a player by an embarrassed referee. Gobert complained in the postgame again, this time saying, after talking with the league office and individual refs with no satisfactory response, and ongoing whistles being blown against him, he might be forced to take justice into his own hands, elbows, hips, forearms and fists. Nobody wants that. The Jazz center himself said he just wants to do his job, just play basketball. Gobert’s been known to complain to the refs often on the floor, although he typically has kept his frustrations from spilling over in loud fashion into postgame interviews. It’s happened, but only in controlled manner. Now, it appears as though the officials are taking their revenge, which is a major issue, a violation of competitive integrity. If a player has a problem with NBA officials, and he gives voice to those problems, the league should handle it the way it sees fit. But for the frontline guys, the ones with the whistles around their necks to aim their ire at a player, that is ridiculous, unacceptable. Even worse, it calls into question what the NBA cannot have questioned — the intentions of referees who can change the outcome of games inside of a handful of calls. If those judges appear to be vindictive, in a game that has as many individual judgment calls as basketball, a game that is hard enough to officiate just by nature of the way the thing is structured, at its most rudimentary levels, the whole endeavor can transform from the NBA to the WWE. The mere perception of that is damaging in a major way. As mentioned, basketball is impossible to referee in any flawless manner. The players are too big, they move too fast, the contact is too frequent to get every call right. In fact, in my years covering the league, there are all kinds of missed calls in every game, maybe every trip down the floor, from the basic to the complicated. I’ve stuck up for refs in the past, even as fans have gone ballistic over calls that seemed questionable. These guys are human. They don’t have lasers for eyeballs. The complaints I do have usually center on the NBA’s star system, a stupid trend in which the league’s best players are favored, treated with more respect on calls than run-of-the-mill players, and swallowing the whistle at the end of games. The stars already have an advantage based on their talent. Why give them an even bigger advantage by way of status or reputation or bias? That should be eradicated. I get it. The league isn’t eager to have its best performers disqualified from a game because of foul trouble. That’s bad marketing. But integrity is even more important. And a foul or any violation at the beginning of a game should be a foul, a violation at the end. If mistakes are to be made, make them equal mistakes, all around. I’m no homer, never have been. I repeatedly stood up for the refs through the years, back when some Jazz fans thought the league was out to get their team, disfavoring it in the playoffs because Salt Lake City is a smaller market. I called BS on that. 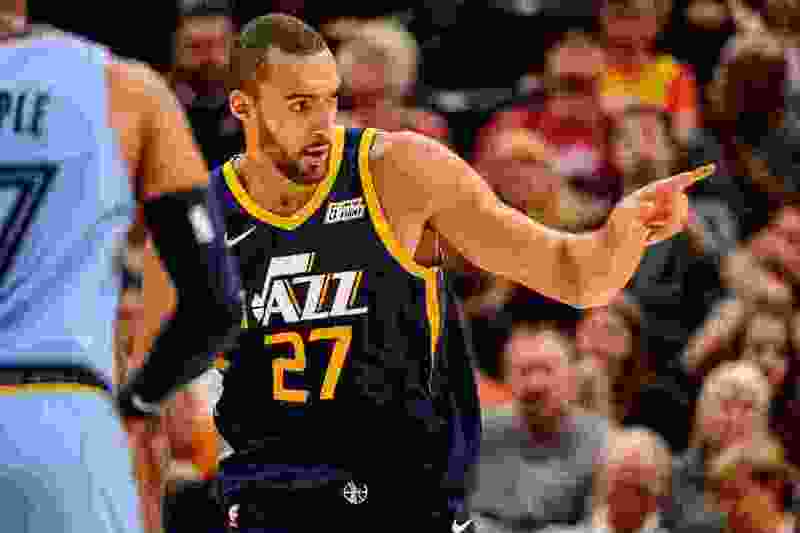 But right now, even objective eyes can see Rudy Gobert’s getting picked on — in part because of his game-to-game demeanor, too many routine gyrations after bad calls, and especially since he gave loud voice to reporters regarding “inconsistent” calls, drawing attention to refs’ inadequacies that now have taken a turn for something considerably worse — a point to make, a lesson to teach, a toll to exact.